6. PRELIMINARY MEASURES TAKEN TO IMPROVE CONDITIONS. By the afternoon of the first day (16th) 27 Watercarts were provided by 8 Corps and a supply of food in time for the evening meal. All initial supplies had obviously to be carefully guarded and issue supervised. The psychological effect of this provision was amazing and each day the atmosphere in the camp has improved, changing from one of extreme apathy through the gradual appearnace of a spark of vitality to real job and an interest in life. The magnitude of the Medical problem in the supervision of special feeding and supervision of feeding for those cases of starvation cannot be over-estimated. Steps had already been taken to provide a special gastric diet for these cases and an attempt to mobilise helpers to ensure that the weakest are fed until such time as they can be moved to a new hospital area. 3. Read Source 3. 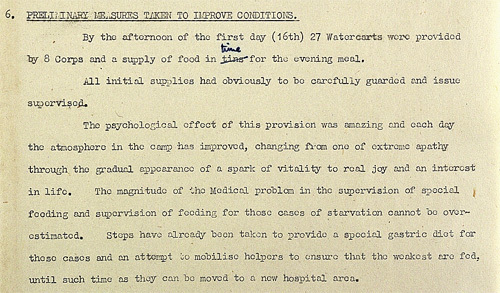 This section of the document describes how the problems of feeding the prisoners at Belsen was initially handled.